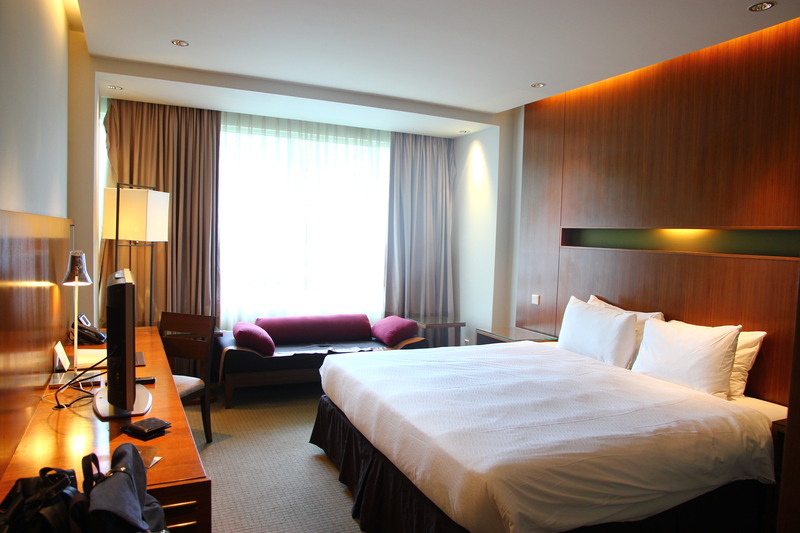 Home » Hotel Review » Hotel Review: Sentosa Amara Sanctuary Singapore Staycation | Perfect Weekend, Not. Sentosa Amara Sanctuary has the luxury of being an almost perfect resort location, with lush gardens, large open spaces and its central location on the sunny island of Sentosa. Rooms options range from typical hotel rooms to studios to suites with private pools. And if you are in luck, you will catch the Sentosa peacocks roaming around the resort! How about an infinity pool to complete the supposing perfect staycation? Definitely a nice place to unwind after a long week, but just be warned of the lack of pool chairs (4 chairs to be exact); with many of the swimmers having to resort to resting on the hot wooden plank flooring instead. As part of the staycation’s entertainment, please feel free to stay at the edge of the pool to see how the swimmers dash to take over each emptied chair whenever a fellow hotel guest heads off. The rooms at Amara Sanctuary deserves a thumbs up though! Nicely done, with warm colours and a rather large space for a typical hotel room. Properly the only issue here was the additional $10 paid to upgrade from the Deluxe to Premium room – kid you not, we were told the Premium room gives a view of the lush greenery with an unobstructed sea view of the South China Sea. Well, behind the curtains of the room’s window was nothing but a TREE (to be exact treeS) obstructing the entire sea view. We have warned you, don’t be fooled into this upgrade. Now, since we were upset with our room’s view, we decided to take a stroll in the resort and sneaked our way into unoccupied villas! If you can afford it, I must admit this does remind me of the villas in Bali! One point to note though, at the high published rates (S$3,500 a night) for Amara Sanctuary, you might just be better off renting an apartment for an entire month! Again, the gardens and its tranquil environment are some elements which probably give this resort its five stars status. Without which, I am skeptical if it even deserves four stars (read on to the rants to find out why). The free snack corner at the hotel lobby which saved many of the hotel staff from angry hotel guests at Amara Sanctuary; and somehow, I just feel it wasn’t just a bad day – it is probably a bad hotel. – Upon check-in, the guests were categorically denied any early check-in before their official check-in timing at 3pm. – Did we not mention that the hotel stay package does not come with free wi-fi? In this age and time, it seems ridiculous that a five star resort hotel actually charges high prices for such basic services. – Probably what really disappointed us most was not the various warp hotel policies, but the service. We can blame the labour crunch, but the seemingly lack of passion may just be the reason. If you are still keen, for bookings and further information, do check out the Amara Sanctuary Resort website. 7 Comments on Hotel Review: Sentosa Amara Sanctuary Singapore Staycation | Perfect Weekend, Not. i stayed there before and it was ok. so sorry you had a bad experience. You know about the $10 upgrade of the room? It happened to me before at Westin, upgraded, no view. So I asked for a change of room. Next time, don’t let the hotel bully you. And the wifi thing. I AGREE. I dunno why so many 5-star SG hotels don’t provide wifi!!! We live in the 21st century. Wth, man. Why no wifi? Must admit the hotel environment was good la. Guess the service (i.e. the lack of) and the very poor attempt to rip monies off the hotel guests are just self-destructing. Lucky you! I am sure they can do better and hopefully my less-than-ideal stay was just a moment of bad timing with the establishment.